Montana communities depend on revenue from oil and gas companies to fund important services like our schools. And yet, through policy decisions by the state legislature, Montana has given oil and gas production companies major tax breaks that have cost the state millions in lost revenue that could have been used to invest in our communities. This tax break has cost the state and communities impacted by resource extraction tens of millions of dollars per year. The most recent boom in natural gas and oil production has created an increased strain on public services on structures. Rather than maintaining needed services like education, public sewers, water systems, and good roads, that would help Montana retain and grow jobs, the money was instead given to oil and gas companies as a tax break. In short, the oil and gas tax holiday is ineffective and has cost Montana millions in revenue for public services and infrastructure. It is time to take a hard look at the effectiveness of this corporate tax break. Severance taxes reimburse communities for the permanently reduced value of their land. There is broad agreement today that the severance tax represents good tax policy: private companies should compensate Montana for irreversibly removing and profiting off of natural resources from the state. Taxing oil and gas at a lower rate at the beginning of production is particularly problematic because wells produce significantly higher amounts at the beginning of their lifetime. 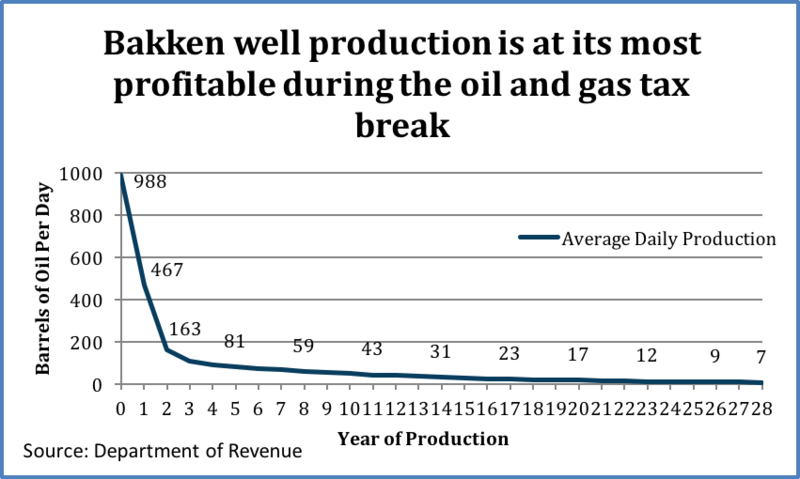 The following graph from the Montana Department of Revenue shows the average daily production of oil in the Bakken Oil Fields. In a seven-year period, from 2008 to 2014, the tax holiday cost the state and counties $265 million in revenue (Table 1). Revenues are split approximately 53/47 between the state and counties, and approximately 90% of the state’s share goes to the state general fund, used to help pay for public services like schools, roads, and bridges. Consequently, the general fund lost approximately $126.5 million over the seven-year period. Local governments experienced a loss of $124 million. The cost of the holiday to the general fund for the 2015 biennium is estimated to be $53.6 million. Over the same time period, counties are expected to have lost almost $53 million. One argument used to justify the oil and gas tax holiday has been that it will encourage more development; however, a comparison of the effective tax rates of our neighboring states casts doubt on that claim. While actual tax rates vary due to numerous factors--like the length of time a well has been in operation--the effective rate is the average tax rate paid on all extraction. Montana’s effective rate of taxation on oil and gas, 9.8%, is significantly lower than both Wyoming’s 15.9% and New Mexico’s 15%. Yet Wyoming and New Mexico have higher total production value. In 2008, Wyoming saw $19.2 billion in oil and gas production. New Mexico’s production totaled $14.5 billion. Both of these figures are substantially higher than Montana’s $3.1 billion total for the same year. In other words, the amount of production does not appear to be related to the effective tax rate. Likewise, when comparing tax rates over the lifetime of a typical well in the Bakken formation, North Dakota has a tax rate of 10.6%, higher than Montana’s rate of 7.4%. Despite this higher tax rate, North Dakota still ranked in the top five of oil and gas producing states in 2011. Montana, however, did not. Although North Dakota also has an oil and gas tax holiday, it does not go into effect unless oil prices are below $52.59 per barrel, preserving revenue for the state when production value is high. The Montana-based Headwaters Economics’ historical analysis of Montana’s tax shows that lower rates have not improved the production in Montana relative to other states. Montana had the smallest growth in production of the five Intermountain states studied after reducing the state’s oil and gas rates in 1999. Montana production grew by $2 billion between 2000 and 2006, while production in Wyoming, with a tax rate 50% higher, grew by $10 billion. University of Utah Professor of Economics Gabriel Lozada studied Utah’s exemptions on oil and gas for development of new wells, and found that eliminating the tax holiday for new wells would result in a less than 1% reduction in new wells. However, severance tax collections would increase by 15-16%. He asserts that because the additional tax revenue dollars would be spent on other activities within the state, there should be no reduction in economic activity in the state. It is not surprising that oil and gas taxes have little effect on the amount of resources extracted in a state. Both common sense and research tell us that oil and gas companies will operate where there is oil and will not base decisions on state taxes, a small fraction of their total costs and profits. These counties still need jobs, and oil and gas will continue to be part of the mix. But giving these resources away means forgoing other investments that will lead to sustainable prosperity. Responsible taxation retains jobs (the booms will still come), but will also allow oil and gas counties to better weather the busts and begin diversifying their economies. 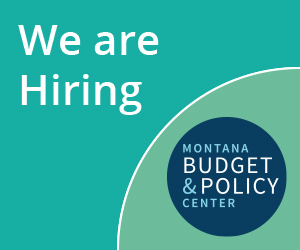 While Montana’s revenue sources are more diverse than many surrounding states that are heavily reliant on natural resource taxes, recent declines in production have negatively impacted revenue to the general fund., Oil production in Montana has been declining since 2015, due to a dramatic drop in oil prices, from near $100 a barrel in 2014, to $50 in 2015. ,  This drop in production and price will cause a decrease in revenue to the general fund in coming years. In 2014, oil and gas tax revenue contributed nearly $110 million to the general fund, followed by $73 million in 2015. According to Montana Legislative Fiscal Division, the next four years are predicted to see contributions of less than $50 million per year. Furthermore, the decrease in oil prices is also likely to decrease individual and corporate income tax revenue, as well as U.S. mineral royalties. Currently, there are no drilling rigs operating in the state, and due to the oil and gas tax holiday, new production would be unable to help increase revenue to general fund in the next few years, as these wells would pay very little for their first 18 months of operation. Repealing the oil and gas tax holiday, coupled with establishing an oil and gas trust fund (see below), could help Montana protect against future downturns such as this one. Montana gives away more in tax expenditures than neighboring oil and gas producing states, nearly one million dollars per unconventional oil well over the course of ten years. The tax holiday accounts for over half of this. Conversely, North Dakota puts $930,680 over ten years per unconventional oil well into trust funds to help protect against bust cycles. Due to the decrease in oil prices, North Dakota has been experiencing significant budget shortfalls, causing the Governor to make substantial cuts to the state’s agencies. However, some of this shortfall has been able to be mitigated by use of the Budget Stabilization Fund, which is largely funded by oil taxes. Because North Dakota limits its tax holiday only to times when oil prices are very low and preserves a good portion of oil tax revenue through the long-term Budget Stabilization Fund, North Dakota can provide stable returns even during bust cycles. Revenue generated during boom cycles can then be available at the start of the next boom, helping to manage the increased needs of communities before tax revenue becomes available. The 2015 Montana legislature voted against a bill (HB 310) that would have created an oil and gas trust fund for Montana. Tax policies that eliminate or delay revenue cause communities to play “catch up” when there is increase demand for services like roads, sewer, etc. Montana communities receive revenue from taxes 22 months after well completion (the tax holiday period, as well as the four months it takes for taxes to be collected and distributed). Montana communities can help protect against the downturns caused by bust cycles and meet the demands during booms by repealing the tax holiday. Montana policymakers have several viable options for addressing the oil and gas tax holiday to use the resulting revenue to boost Montana’s economy to help affected communities deal with the impacts of oil and gas development. One possible solution is to repeal the holiday outright, which would simply ensure that newly drilled wells are taxed at the same rate as older wells. An alternative to completely repealing the oil and gas tax holiday is implementing a trigger price at which the holiday would go into effect. Creating this trigger would make Montana’s tax code more similar to North Dakota, which has a trigger set at $52.59 per barrel. If Montana adopts the same trigger, during periods of low oil prices, the oil and gas tax holiday would go into effect. Creating a trigger price at which the repeal goes into effect makes sure that Montana is fairly compensated for our resources when prices are high and oil companies are making significant profit off extraction, while at the same time allows us to remain competitive in the energy market when resource prices fall. In either case, repealing the oil and gas tax holiday or instituting a trigger could change the way Montana’s vital oil and gas revenues flow. Rather than benefitting large corporations, this revenue could benefit the state and local communities. Proper investment of this funding could build the region for years to come by addressing both immediate and long-term needs. For example, a portion of the recovered revenues could be used to establish an Oil and Gas Trust Fund. This trust fund would help support the state by providing a sustainable revenue source to the state’s general fund, similar to the Coal Tax Bond Fund, helping to fund our schools, improve our infrastructure, and support the economy. Revenue from the reform of the tax holiday could also help create an impact fund to support both spillover counties and counties whose oil and gas tax revenues are not sufficient to meet the rising service and infrastructure demands of the resource boom. Some have argued that the term “production tax” is a misnomer. See, for example, Gabriel Lozada, “The Effect of Proposed 2009 Tax Changes on Utah’s Oil and Gas Industry,” December 18, 2008 (“On a final note, “production” of oil and gas is in a sense a misnomer. Oil and gas were produced millions of years ago; none are produced today. The oil and gas industries extract these products today, and if their activity is reduced, more oil and gas will remain in the ground for future generations of Americans to use. So diminishing “production” of oil and gas from Utah today is properly understood not as decreasing the total amount of oil and gas ever extracted from the state, but instead as shifting extraction from today to the future.”). Figures calculated from Department of Revenue’s Biennial Report (2012-2014). Based on 2013 and 2014 taxable production, total revenue lost due to tax holiday during the 2015 biennium was approximately $112 million. The intermountain states studied were Colorado, Montana, New Mexico, Utah and Wyoming. Gabriel Lozada. “The Effect of Proposed 2009 Tax Changes on Utah’s Oil and Gas Industry.” December 18, 2008. Legislative Fiscal Division, “Historical Oil Production and Rigs in Montana by Calendar Year,” May, 2016, accessed September, 2016. http://leg.mt.gov/content/Publications/fiscal/2016%20Chart%20of%20the%20Week/cotw-oil-production-rigs.pdf. Ronald A. Writz. “Saving for a rainy, oil-free day.” FedGazette. Federal Researve Bank of Minneapolis. September 3, 2013. https://www.minneapolisfed.org/publications/fedgazette/saving-for-a-rainy-oilfree-day. Headwaters Economics. “Oil and Natural Gas Fiscal Best Practices: Lessons for State and Local Governments.” November 2012. https://headwaterseconomics.org/wphw/wp-content/uploads/Energy_Fiscal_Best_Practices.pdf.